It was a long week. My husband had to be out of the country all week on business and I had to resolve a very challenging situation at work with lots of ramifications. But now it’s Friday! My work challenge appears to be successfully resolved; and my nice husband is home, bearing gifts from Barcelona. For me: a large bottle of Custo Barcelona L’Eau. Lovely! Custo Barcelona is a fashion firm that was born in Barcelona. Its style is young, funky, colorful and cheerful. So is its fragrance. 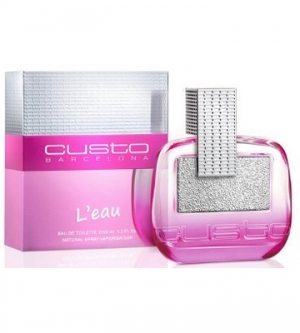 According to various websites, CB L’Eau is supposed to be a lighter version of the original Custo Barcelona fragrance that came out in 2008. The same “nose”, Alberto Morillas, developed both. For L’Eau, the top notes are bergamot, grapefruit and galbanum. Heart notes are peony, jasmine and “exotic fruits.” Base notes are musk, tonka bean, woody notes. It smells very European to me but not French. Catalan, perhaps! Definitely a citrusy floral with woody undertones: bright, cheerful, feminine, warm. Custo Barcelona fashions, from Photoquivir 2015. I love Barcelona, especially the Barri Gotic and the Eixample neighborhood. I love the food, especially the fresh seafood, the tapas and the different kinds of sangria.I love Antonio Gaudi’s architecture there, including the stunning Sagrada Familia cathedral, still unfinished; his signature curves, bright colors and fanciful patterns have clearly influenced later Barcelona designers like Custo Barcelona and Desigual. And Custo Barcelona L’Eau definitely evokes the city, with its playful vibe layered over complexities. 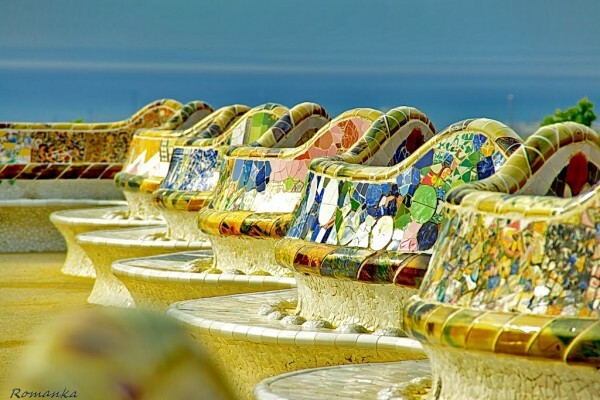 It reminds me of the Parc Guell, a Gaudi masterpiece and fantastical park with gardens, mosaics and fanciful structures. The gardens contain fragrant herbs, trees, and flowers. Some of its trees are tropical; some bear fruit. The blog In Search of a Thousand Cafes describes it well, with many lovely photos, including the one above. CB L’Eau starts off bright and juicy, but the galbanum top note gives it a green, herbal astringency that cuts the sweetness of the citrus notes. It slowly blossoms into a light, fruity floral — more flowers than fruits, which I like. This part of its progression matches the bright pink of the peony notes and the pretty bottle. I love how the shape of the bottle matches the typography of the design house’s logo. The bottle is really unique, with its textured metallic inset of silver, asymmetrical cap and ombre tinted pink glass. The last phase of CB L’Eau is lightly musky, with sweetness from the tonka bean and dryness from the woody notes. I can still smell the base notes on my wrist ten hours after first spraying myself. All in all, a delightful gift from a delightful man! I’m grateful to have both.